Ah yes, the Atlas C-Liner. Kind of an odd little duck isn't it? The other of Atlas' two initial releases in 1967. Fairbanks-Morse offered the "Consolidated Line" (hence the term "C-Liners") in 14 different configurations to meet individual Railroad needs. Atlas/Rivarossi chose to model the most uncommon version with the six wheel rear truck. On top of that, none of the railroads represented by the offerings owned these locomotives. Still, it was wonderful to have these available on the market back then when we N scalers were grateful to have ANY locomotives let alone them being correct. 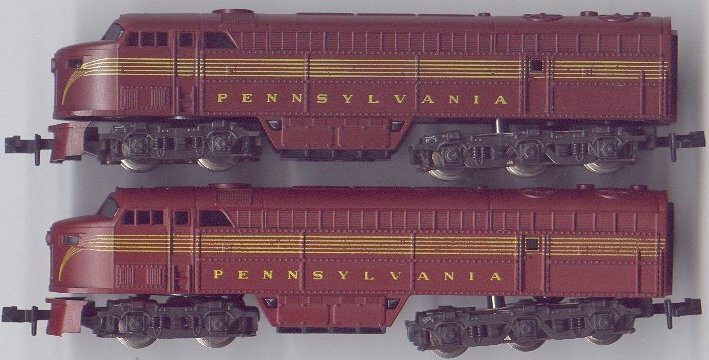 The Milwaukee Road and Pennsylvania Railroad did have C-Liners but they were B-B types. 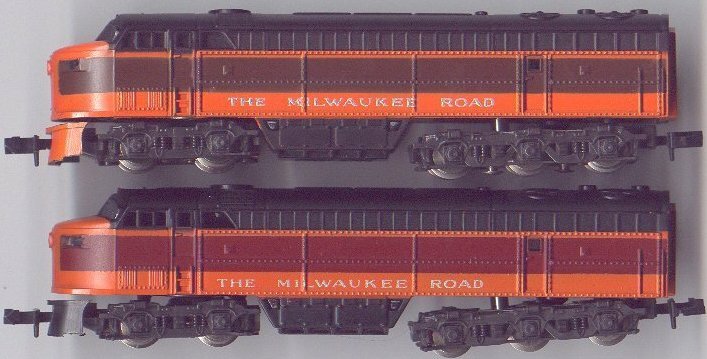 These A1G locomotives were offered in Santa Fe, Union Pacific, Milwaukee Road, Pennsylvania, and Southern Pacific liveries. This is the only A1G loco series to also include matching dummy units. The metal frame and motor etc. are replaced by a plastic frame and weight. Although the calfs of the SW1500 Cows and Calfs are dummy units too, the calfs, of course, have no cab so it's a bit of a different situation. The basic construction is the same as the E8s but kind of in reverse. Again, I feel that the Rivarossi carbody representation of the prototype is pretty good. The front truck is the drive with both axles driven in the same way as the rear two axles in the E8 rear truck. Since the idler gear is associated with the front axle rather than the rear axle, however, the motor must rotate in the opposite direction from the E8's motor for the loco to go in the same direction. The motor is identical to the one used in the E8s. The rear truck is used for current pickup with all six wheels contributing as on the front truck of the E8. A push-in headlight bulb is used and is held in place by a plastic block/contact that press fits into a square hole at the front of the frame. The manufacturing period appears to have been about the same as the E8s and it looks like Rivarossi alternated months between the two. For instance, of the 30 or so C-Liners I own, the manufacture dates are 10-67, 11-67, 7-68,and 4-69 whereas the dates on the E8s I have are 9-67, 7-68, and 1-69; 7-68 being the exception. An interesting note is that some of the early C-Liners were assembled in Yugoslavia from mostly Rivarossi parts. I will note differences in the BODY and FRAME sections below. The C-Liners were on the market for almost two years longer than the E8s. America's Hobby Center was still selling them well into 1975. Atlas Identification: "ATLAS (in the "graduated" logo) Made in Italy by RR" cast into underside of frame in the fuel tank area on Italian assembled units. "ATLAS (in the "graduated" logo) Yugoslavia" cast into underside of frame in the fuel tank area on Yugoslavian assembled units. "ATLAS Made in Italy RR" molded into the shell on the center underside of the roof. There is no number molded into the shell. It has been reported that Rivarossi marketed these units on their own after the association with Atlas was over so look for the Atlas name. Variations: The variations on these units are pretty much the same as with the E8s but I will comment on them anyway because there are some differences. The variations are the same as for the E8s. Italian-built: The "maroon" strips along the sides are really brown. Some units have semi-gloss paint here and some have flat paint. I haven't seen any appreciable differences in the U.P. or S.P. units, although I dont have any Yugoslavian-built locos to compare. Earlier units have a smaller (approx. 1/8") diameter headlight bulb hole cast into the frame. Later units have a larger (approx. 3/16") diameter hole. This was to accomodate a change in headlight bulb size. With the vast majority of the frames, the top sides and front extend up to cover both the side windows and windshield. However, on the very first Milwaukee unit I bought in about 1968, the frame covers the side windows but NOT the windshield. I have a Santa Fe unit with the frame covering about 75% of the windshield. On both of these units, it doesn't look like incomplete casting (non-fill) so they must have been made this way on purpose. The Italian-built unit frames are painted with a semi-gloss black paint whereas the Yugoslavian-built unit frames are painted with a gloss black paint. The image linked above kind of shows this too. You can see the sharper reflection lines off the paint of the Yugoslavian unit. The Italian-built units use a black wire connected between the rear pickup contact and the motor whereas the Yugoslavian-built units use a green wire. The same Zamac malady that struck some of the E8 and other Rivarossi frames occured with the C-Liners too with swelling and cracking. Some frames do, indeed, have only two motor mounting holes drilled or cast diagonally into the frame. This truck has basically the same variations as the E8 rear truck (there are, of course, only two axles instead of three). There is a difference in that with earlier units where one side of the axles are insulated, the insulated sides have to be on the left side rather than the right as on the E8s. This is due to the required opposite rotation of the motor to get the loco to run in the same direction (the right wheels are ground and left are hot, just the opposite of the E8s). Thus, the traction tires are on the left side of the engine instead of on the right as on the E8s. Earlier units have straight-cut gears and later units helical-cut gears, just like the E8. The earliest units had a snap ring/washer retainer, later units, the copper keeper plate, same as the E8. Almost all of my C-Liners have the traction tires on the left side. I do have one with them on the right and one with them on either side of the rear axle, however. Of course, these are on units with both sides of the axles insulated. The variations here are the same as with the E8 front truck with the progression from plain axles to sprung axles to sprung axles augmented by auxilliary pickups. The motors themselves are identical to the E8 motors and the same variations occur. In the case of the C-Liner, the front (hot) motor brush holder pushes against the hot contact for the headlight bulb. Please see the E8 page for a more in depth explanation of the features and variations which are common to the two models.